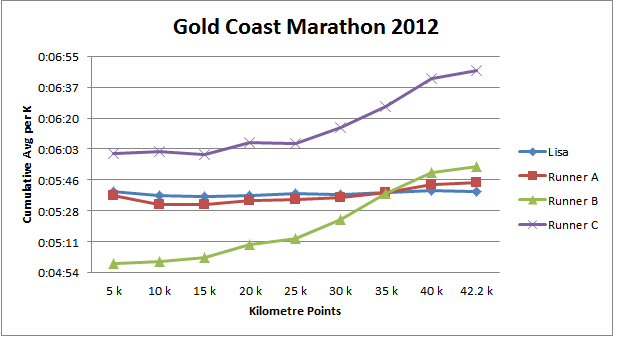 Recently Lisa completed the Gold Coast marathon, here is my overview of her training and race and my thoughts on pacing a race. 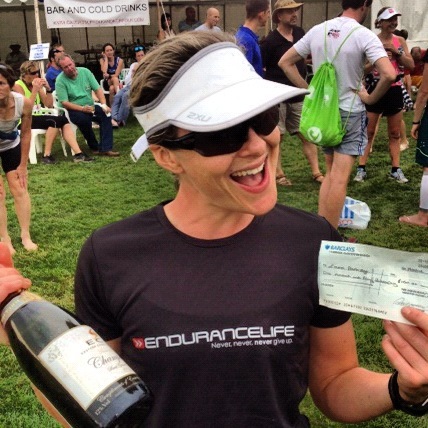 Lisa had targeted the Gold Coast marathon well over 6 months ago with a target of beating her previous marathon time and a stretch goal of a sub 4hr marathon. After initial discussions I set about planning the training and Lisa set about completing the training. Throughout the training I continuously nagged about negative splits and pace control and I would biasedly say it was only in the last few weeks of training that I finally convinced Lisa that our race strategy would be to hold the same pace for the entire marathon (ie run even splits and not start out fast). I think the response was something like, “ok I’ll do it but you better be right!” I am obviously happy as Lisa achieved her sub 4 hours and stuck to the race plan perfectly. I love it when we achieve our goals by training hard and racing smart. I am a firm believer that on race day most people who don’t achieve their goals it is not from a lack of training (however this does apply to some) but more from incorrect pacing (and nutrition) on race day. Whilst I will not go down the path of setting a time goal, but to say when you set a goal time it must be realistic and supported by training both in terms of endurance and interval (speed) work, there are many calculations out there to predict race times and most will give you a good indication, however pointless if the right training has not been put in place (I set goal race times by running time trials regularly throughout a training plan). 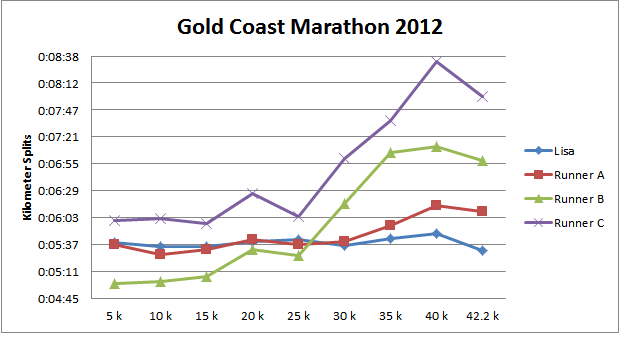 Back onto pace control, below is a graph of 4 runners in the marathon (3 random) and whilst I cannot comment on all of their training it can be seen that all 3 of these runners did not pace their races correctly with 2 of them blowing up drastically starting from 15k and the other one only marginally going too fast but still paid the price. Also 2 of the runners had been ahead of Lisa up until the 35k point and neither finished sub 4, but I am prepared to predict that both could have achieved this time with better pacing from the start. Hopefully you are still reading, my point is don’t put all your hard training to waste by not performing on race day, get your pacing right, train to it and race to it. The first graph shows the cumulative avg splits as minutes per k, the second graph shows the actual split for each 5k, you will note in all 3 examples fatigue was creeping in between 15 – 20k, so not even at half way! 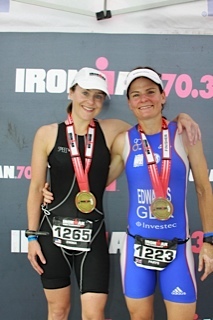 My apologies to Iain who submitted me with this great race report and it has taken me far too long to post. I am an I r o n m a n ! Before I start, I have to make sure I thank the person who made it possible. 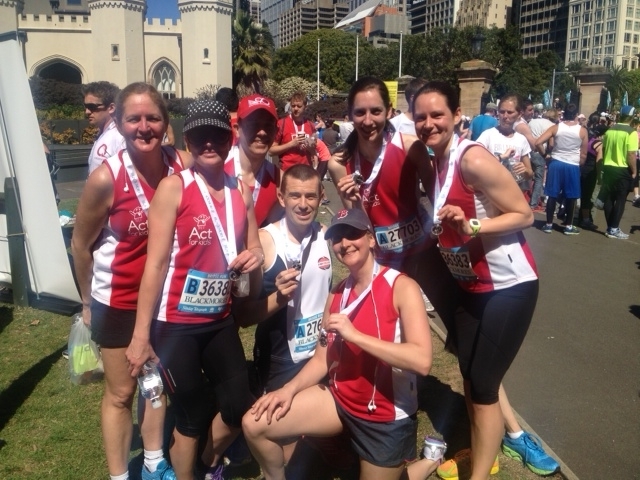 From the moment I came home saying I’ve made a silly bet, to kissing the sweaty mess I was at the finish line. 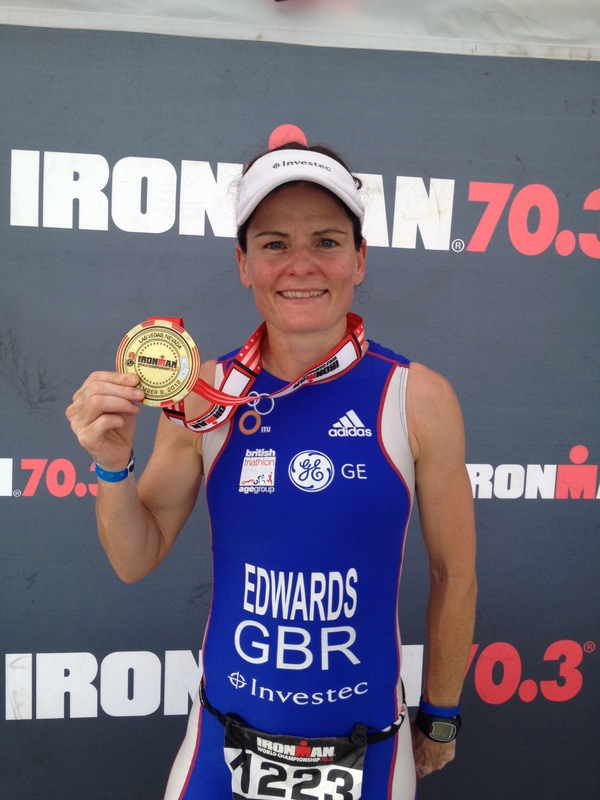 Yvonne: the wife of steel behind this Ironman. What a day! 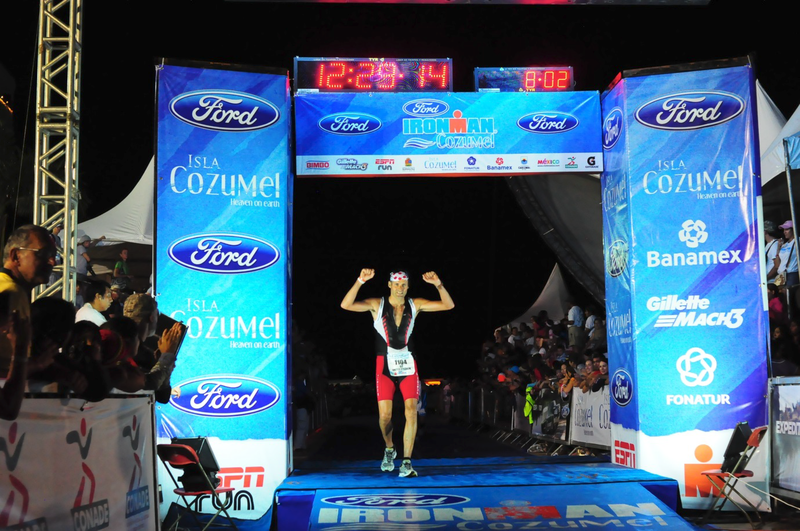 An amazing experience with an atmosphere and support from the Cozumel Islanders way above anything I expected. The day started with an Ironman breakfast of coco pops, bananas and coffee, with the morning ablutions out of the way it was onto the coach and off to the start. After checking the bike, loading it up with drinks and gels, and pumping the tyres up to the required pressure it was off to the start. 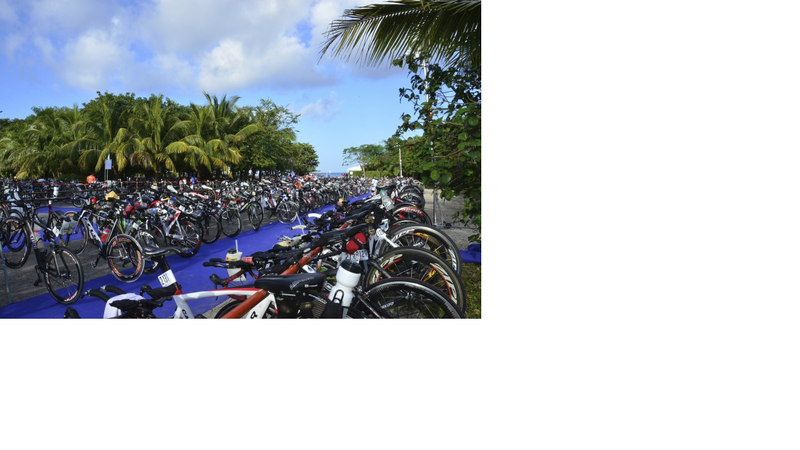 The swi m start was as expected with 2300 people in the water all starting from the same place, hectic to say the least. I’d positioned myself a little to the side of the main pack as didn’t want to get bashed about too much in the usual human soup that is the start. Even after the first 1km it was difficult to find space in the water to get into a rhythm, and navigating was difficult so it did rather come down to following the person in front as they had to be going roughly in the right direction. This worked ok with only a slight detour on the back straight. longest part of the course. 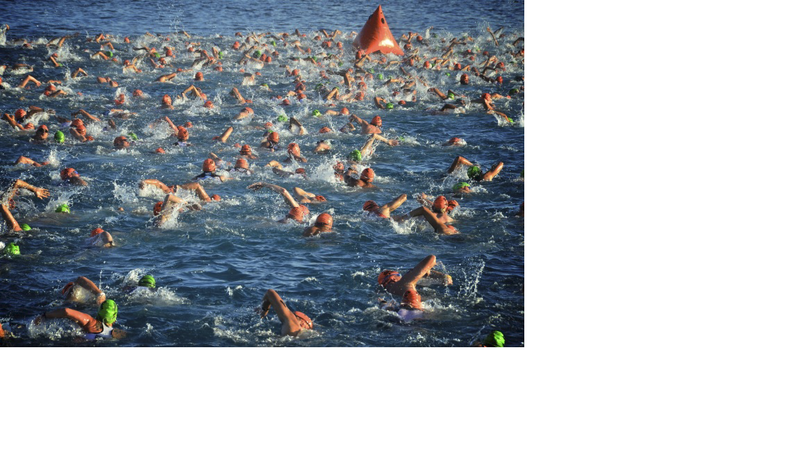 Especially, as for the last 500m we were swimming along the coast so were aware of the supporter’s cheers. I’d completed the 3.8km swim in 1 hour and 15 minutes, which was better than expected so it was definitely a good start to the race with only a few minor stings from the small jelly fish that seem to have collected by the exit point ! Out of the water and running to the changing tents I managed to see Yvonne on the way through. 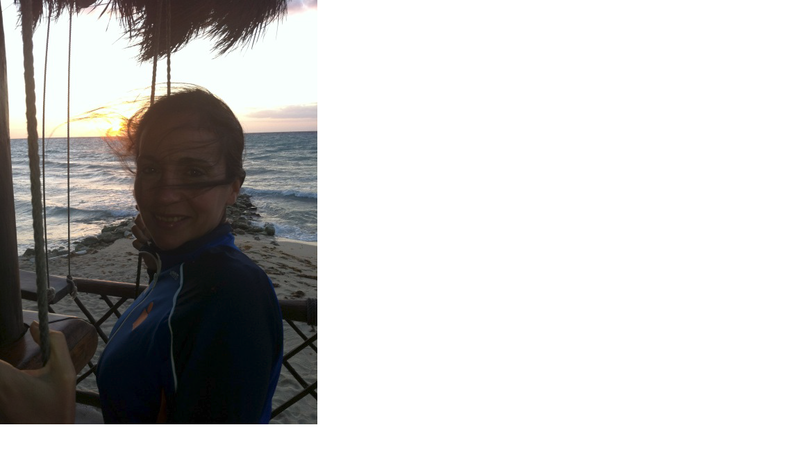 I guess she could tell by my big grin I was pleased with the swim time. 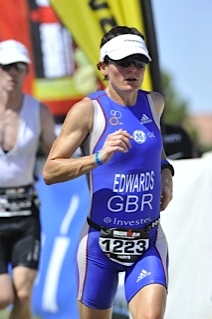 Transition is so much easier when you don’t have to fight out of a wetsuit! I’d also remembered to take the all-important Imodium+ at this point ! I’d walked through tranistion a number of times so knew exactly where my bike was. As you can see it would be easy to miss it ! 6 minutes and 10 seconds to get my bike gear together and head out onto the road. Heading out onto the bike I was feeling good. Having ridden the roads when we’d arrived on the island I was looking forward to a fast flat ride. 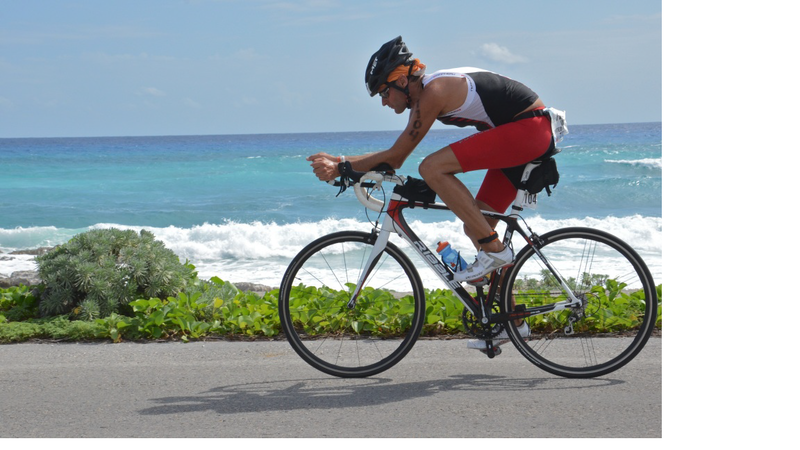 The course was 3 laps around the Island, on the first lap I realised it wasn’t going to be an easy ride, as 2/3 of each lap was affected by the strong winds that were blowing across the Island. The scenery was stunning on the wild undeveloped cost line, but I could feel I was burning my legs up to keep my desired pace. 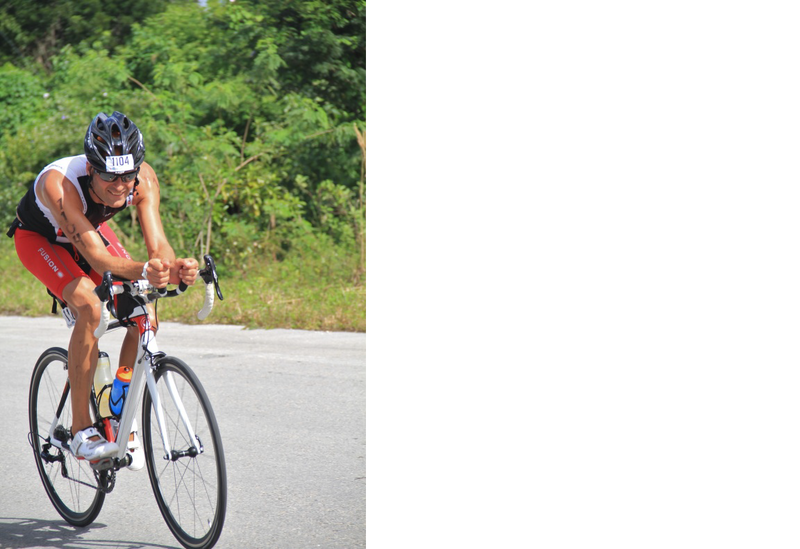 I talked with Tongy, my coach; about the fact that the flat course presented a slightly different challenge to the hilly terrain I’d been training on. I’d thought that with the extra strength I’d have in my legs from the hills I wouldn’t have a problem holding the race pace. Of course I hadn’t account for the wind. When training in the hills your legs get a rest when coming down hill. On the flat you have no such luxury. Yvonne had positioned herself outside the hotel we were staying in, which was right next to the course. It was pretty cool giving her a high five each time I came around. Seems she’s worked out how long it took to get from the cocktail bar to the road side perfectly as she was there each time I passed. By lap 3 I was cramping badly in my thighs, so had to drop the pace as I was concious I still had to run a marathon ! Coming towards the end of the bike course the crowds were up to full steam with the streets completely lined with people offering their support. I was off the bike in 6 hours and 6 minutes so a little over my target time, but I’d kept to my nutrition and hyrdation plans. 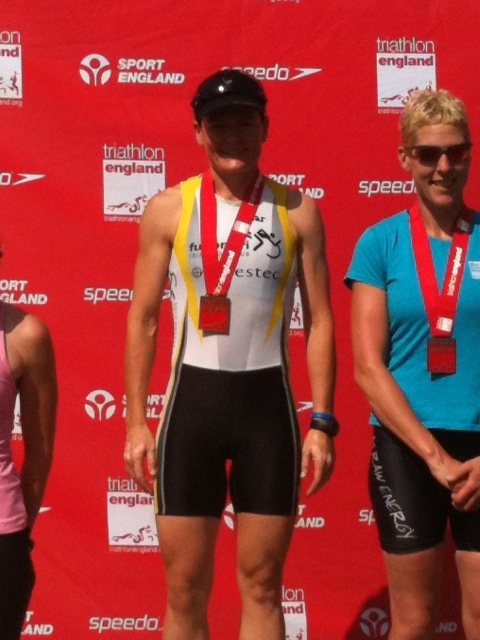 I’d seemed to have got the cramping under control and I wasn’t being too badley effected by the heat and humidity. Off the bike and it felt good to start using some different muscles. I managed to pull the top completely off my talc tube so both feet were well cover as well as a couple of people standing near me. At least my running socks and shoes slipped on easily. With Vaseline applied to the areas of potential chaffing I was out onto the run course in 2 minutes 58 seconds. Look I’m smiling!!! Or is that grimacing? Another 3 lap affair! 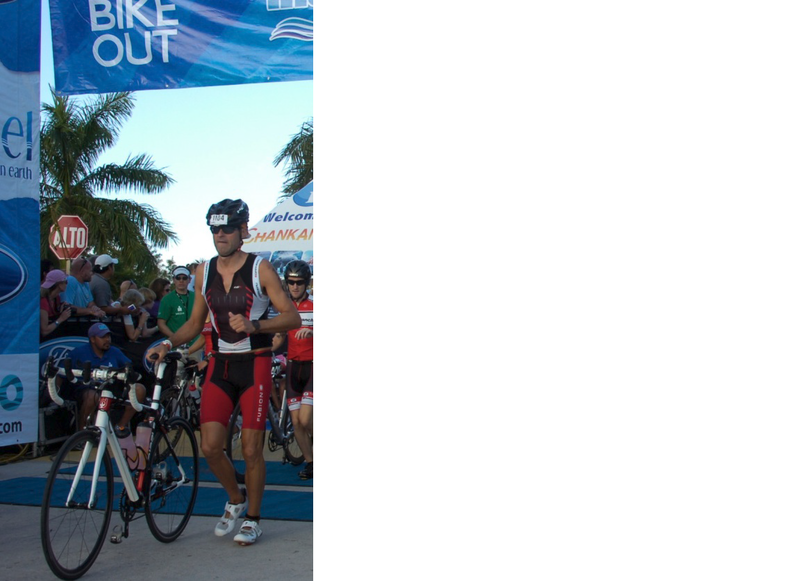 Coming out of transition I knew I’d worked my legs hard on the bike so it was now a case of managing the run. Having gone off way to quick in the warm up events I’d done I was careful to pace the first few Kms. Heading out onto my second lap the Island was hit by a massive rain storm that ended up flooding the run course in a number of places. On the good side it brought down the heat and humidity down, but meant there was no way of keeping my running shoes dry, so blisters were a real possibility. Over ½ distance and I was still keeping to roughly the pace I was aiming for, but soon after I started to cramp up badly again so had to reduce the pace considerably. I couldn’t stop and walk as that made the cramping worse so it was a matter of plodding on. It was a bit of a shame as I reached the turn around to head out onto the last lap of th e run I saw Yvonne, but couldn’t stop to say hello, it was just a shout of ‘last lap’, just in case I couldn’t get moving again. The last lap seemed as long as the rest of the day put together. It was a case of running between the aid stations each mile and taking on water, bananas and Pepsi to keep me going. Cramp was a real issue for the last few miles and this is where it got mentally rough and it was a case of one foot in front of the other. By this point I knew I was going to finish, even if I needed to crawl. It was definitely the point I felt the most emotional and had a large lump in my throat. The last few hundred metres were amazing, the bands and crowds seem at their loudest. It’s an amazing feeling turning into the finishing straight knowing everyone is cheering for you. I definitely felt an euphoric high or that might just have been the extremely low blood sugar levels by this point. I’d completed the marathon in 4 hours 58 mins, in the end probably only about 45 mins slower than I realistically hoped to finish it in. Iain Morton …. You ARE an I r o n m a n ! I completed in 12 hours 29 mins ! I have to say I was extremely pleased with the time, all in all as fast as I could have gone on the day. 46 seconds under what I had estimated my finishing time to be in the bar the night (ok early evening) before ! It was only then I saw Yvonne as she’d positioned herself behind the finishing line to make sure she could see me finish. Not sure she appreciated the kiss from the sweaty mess I was at the end, but it felt good to have finished! The cramp really hit me then and I tried to blag my way into the medical tent for an IV. No chance. The doctor took one look at me and said drink some water, and have a massage you’ll be fine. Looking inside the tent there were a few people in there who looked like they really needed the help. What a fantastic experience. 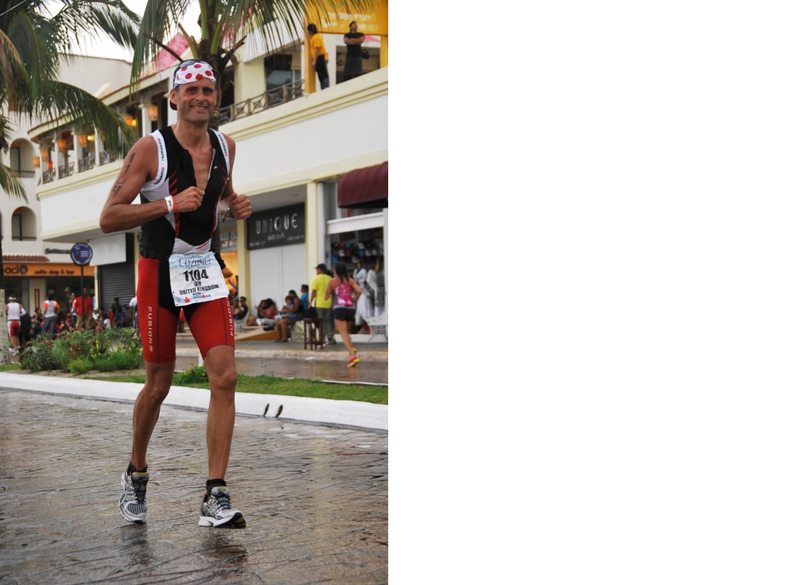 I was glad that I had done all the training as I think entering an Ironman without it would only end in a world of hurt! Exactly what I said after my first marathon !!!!!!!!!!!!!!!!! People I need to thank. Yvonne – for all the cakes and too many other things to mention! 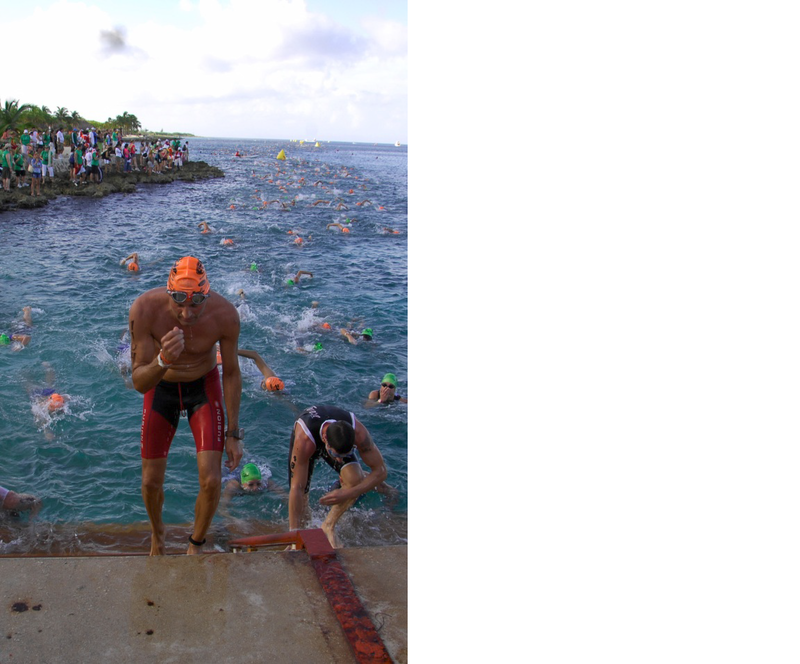 Tongy the coach – for all the sound advice and encouragement throughout the 45 weeks of training Rob at Swim4Tri – Even though he did say at our last session my stroke needed to be completely reworked! Hutch – for all his assistance putting the carbon mean machine together Triathlon Tony, Dave and James – for help training and of course support. Big Al Morgan – who’s stupid idea this was in the first place. 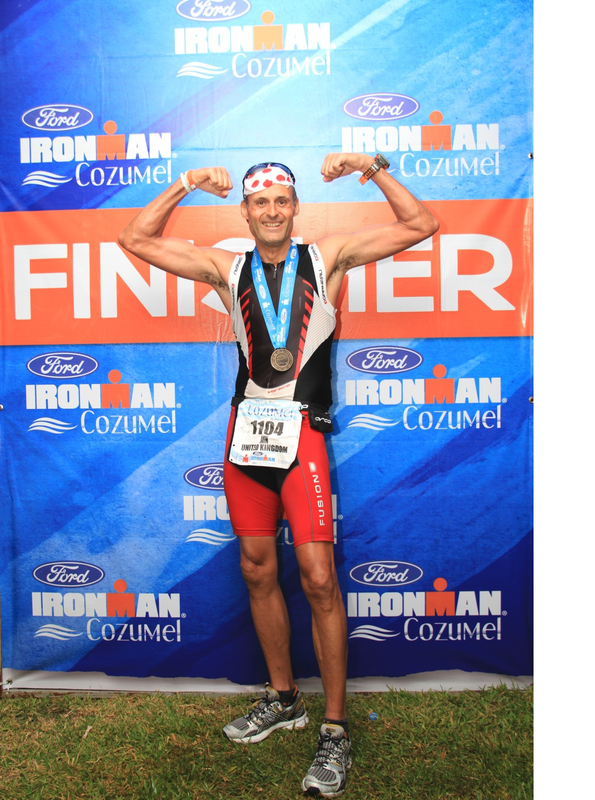 Congratulations to fellow Mexico Ironmen, James, Al and Emma. As for Chris a superhuman effort and I’m sure you’ll make it next time. Of course thrashing big Al by too many hours to mention (as did his wife !!! 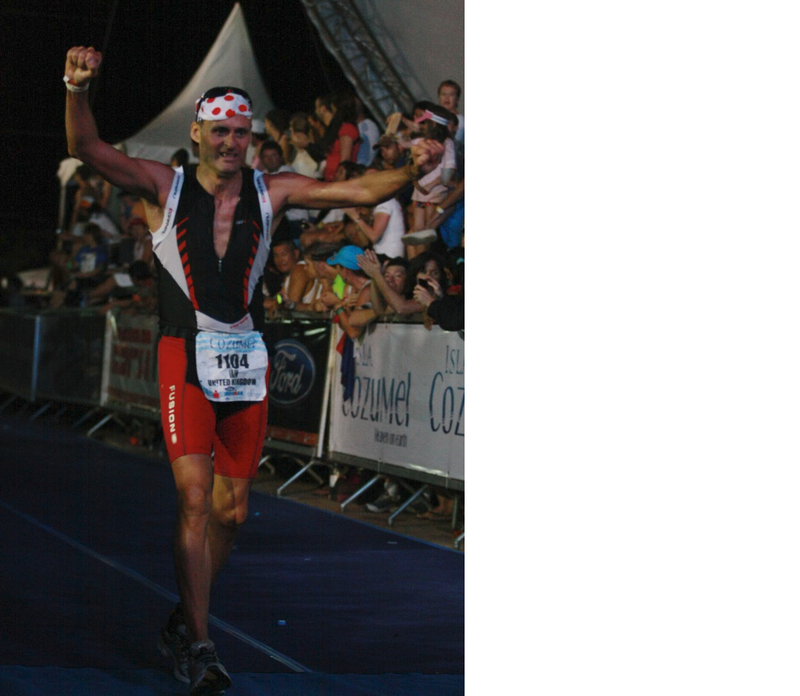 ), I didn’t need to have the Ironman tattoo, however, a t-shirt and medal didn’t quite seem to be a fitting memento of such an epic journey ! Tongy notes, Well done Iain on a great result I always say you reap what you sow on race day and your commitment and dedication to training showed through on race day. 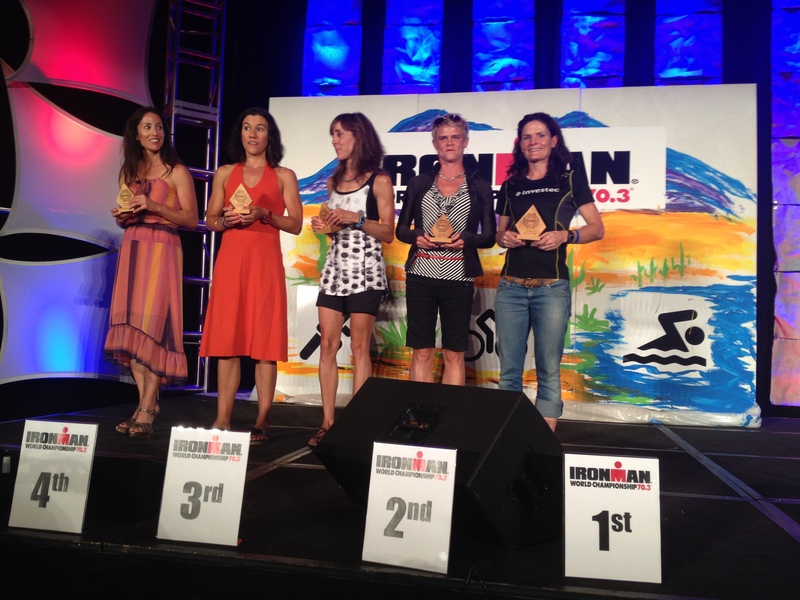 Look forward to hearing about the next Ironman race, great race report.